This is the full list of comments people made about what their schools said when they asked them to provide left-handed scissors. My aunt bought me my own scissors. "Not cost-effective to provide specialised equipment for such a small group." "You just need to learn to cut with your other hand"
"You'll have to buy, we don't provide them"
Again, they only had limited equipment. As I said, they were already there. As stated above, my dad took a case of left handed scissors to both my kindergarten class and 4th grade class. asked for nothing special. That's just 'the way it was., we/I thought. I was the only lefty in the house I grew up in. 3 sibs. and my parents are right handed. Back then they were horrible and didn't cut... so it was pointless to do so. But to be honest, I went to private schools...they probably would've given in. Can't ask for what you don't know exists. Every year until I got to middle school. Had them in school but never hardly used them. Felt better using other scissors. I asked my design & Technology teachers and then had to bug them for ages until they bought some left handed scissors. they were fine because I stopped annoying them. I asked the teacher once why they only provided right handed scissors to classrooms. She told me to ask the school board..never got that far. I asked them to visually identify them so that they could be easily found in the classroom and asked them to get more. I bought them for my class. I did at work, and they were purchased. I did however ask the food technology department about buying a small amount of left handed equipment but I got the impression they weren't interested and expected left handers to adapt. I didn't need to, they already have them! And the brilliant thing is there are always plenty of left handed scissors as not the vast majority are right handers!! I had to buy my own, and they work just great! I have a left handed stepson and I was able to buy left handed scissors for his use. I learned to use "normal" ones at age 3. I learnt how to use right handed scissors. I have a rather odd way of cutting now. I never told my parents it was a problem. I once asked for left handed scissors as I had them at home, and was told to sit down and stop being so silly - there was no reason why I couldn't use the "ordinary" scissors. I was 7. I started carrying my own in my pencil case. I take my own left handed scissors but the school does have some. I used to cry when trying to cut with scissors for school projects. Did not get a left handed scissors until I was an adult. i wrote a letter to get left handed desks and the school board obliged. I'm assuming on my part , my parents didn't ask for any accommodation for my lefthandedness. I'm not really sure what happen but I did tell my mother about it. It would be to expensive to buy them. Jose Mauricio attends a public school in Peru with a very limited budget .Something else there are four left-handed children in his class having the same troubles. Left handed scissors are now in my daughter's class. Maybe my parents or I should! My classroom bought a pair of scissors for me to use when I was in my later years of elementary school. After that, I had my own. My Dad is left-handed and was of the opinion if he managed all right using scissors in his left hand, then I would have to be, too. My design teacher bought a pair of fabric scissors for me to keep because every time the school bought a pair they went missing. My kindergarten teacher was not an understanding woman. My mom asked every year for the teacher to provide left-handed scissors and spiral notebooks that were required for taking notes, but each teacher said that they did not have it in their budget to buy me special supplies. So each year I bought my own supplies and brought them to school to use and I was questioned each time by my teacher why my materials were different than the requirements. I would have to explain to them that I am left-handed and it hurts to write on the spiral of the notebook all the time. My teachers in high school understood, but my Elementary and Middle School teachers disagreed and made me write on their spiral notebooks even though it hurt. My mother taught me to use regular scissors with my right hand, since we weren't aware that left-handed scissors existed. My mum asked at a parent evening if any left handed equipment was available e.g. scissors/rulers and the teacher didn't know. My parents bought me some - but I couldn't get use to them. My parents gave me my own scissors. My parents have been dead for many years. My Parents intended to get me a set of left handed scissors, but due to the time and the difficulty in finding a pair, I adjusted to cutting right handed and still suffer from problems with it. My parents simply bought me left handed scissors so as not to "draw attention" to my being different. My parents were asked to provide me with left handed scissors for my use. My right-handed parents bought my left-handed brother and me left-handed scissors. My son uses the scissors that are for both hands. Are they as good? I provide them. My students find out the first day of school that I am left handed and think it's awesome. They also learn that I provide left handed scissors for them. Never thought of it, will do and see what happens! never thought to ask before but will now! no respond or said they would but never did. No since I didn't know about them until about 6 months ago. No such thing when I was at school! No, but when I ran a brownie pack I made sure we had left-handed scissors in the art/craft box! Nope to expensive for the teachers. not school, I took my own to brownies!! 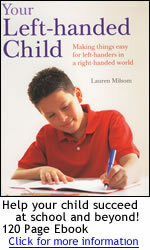 One of my children is blessed as a lefty. I purchased a pair of lefty scissors for her because I knew how much easier it would be for her to use them. scissors no, but in one class I was in need of a left-handed desk and very much to my pleasure I was provided one without much of a hassle. Since my parents were both left handed they knew the difficulty of using scissors and asked for lefty scissors - they were told no as all pupils are treated the same. Stated that any "Left-handed" provisions would need to be self supplied. Students provided their own scissors - my parents bought left handed ones for me. Teacher wanted me to learn to write right-handed, my mom said absolutely not! The only response was: We don't have the money for that. The response was not positive so we try and supply our own named but they do tend to disappear! The school does not have enough money. The school has provided left-handed scissors in each classroom but there a few pairs and these do disappear from classrooms and have to be searched out or the child uses inappropriate scissors. When helping out as a parent in school I have noticed that several children when they start school haven't developed a dominant hand and will use both left and right-handed scissors in the correct hand. Similarity with writing and drawing yet as they go through the school the number who continue to be left-handed decreases. Edward still has some ambidextrous tendencies where as his older sister is definitely left-handed although she uses a right-handed mouse on the computer. The school I help at on a weekly basis (where my children go) have colour coded scissors for left and right handed. The school would get VERY aggressive at even the idea of my parents providing special equipment. The school would not provide them. They told my parents to buy them. the school wouldn't do it because in my year (out of about 400) there were only 10 left handed people, maybe, or at least that was their est. The technician who orders all of our equipment has been ordering LH scissors since before I joined the school 5 years ago, as her own daughter, an ex-pupil is LH with a disabled right hand from cerebral palsy. they didn't think would need it, because they asked me and I didn't want any bothered so I just said no, but it would be handy to have them. They never needed to. The school provided them to me in first grade, and from then on, I've always had to have my own scissors, which were always left-handed ones. They said it wasn't worth it for one student. They said to bring my own pair of scissors. They use the special needs budget to give us scissors and pens. They were not readily available in my day! I adapted and used right handed scissors - no wonder I couldn't cut a straight line! This was greeted in the Reception Class with "well we do have the shears style scissors which helps him hold it". but they didn't really understand that the blade falls differently!!! This would be unfair to right handed pupils !! Unknown when I was at school. Was told that all school scissors are universal and can be used by both left and right handed pupils. We didn't ask since they were already offered. We didn't need to ask, they already had them! We just bought me my own. We were expected to provide our own school supplies. We were told that it wouldn't be fair to give certain students "special" treatment. When I was in school, no one ever mentioned such a thing as left-handed scissors. Yes, the girl and I asked for a second pair of scissors, but the teacher told us the school would no?t buy another. We got to borrow a pair from another glass on a few occasions though. You have to learn to live in a right handed world!